The ABM Series are rugged, industrial grade products manufactured with cast iron housing components, featuring a polyurethane coating and high performance axial bearings. The ABM operators are quarter-turn devices intended for the operation of ball, plug and butterfly valves as well as power and process dampers. These gear operators are well suited for applications in chemical, power, waterworks, HVAC and most general industrial applications. 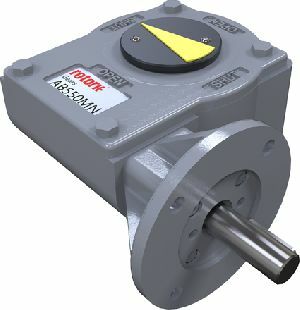 The ABM operators will support electric actuators weight up to 46 kg (101 lbs) and a speed up to 96 rpm. See ABM Literature Page & ABM Options Page for further details.